This is a Recipe for Ripe Mango Puri another one of my experiment with fresh Mangos, this time to prepare a stuffing with Mango Juice and Grated Coconut being the main ingredients. Also given below this recipe is the Marathi version of the same dish. Mix the Refined Flour, Salt, hot Ghee nicely, then add the Milk, prepare a thick Dough, and keep it aside. Boil the Mango Pulp and then add the grated Coconut, grounded Sugar and Cardamom powder and mix it well so as to prepare a mixture. Prepare medium Lemon size balls and roll the balls one by one, as you do while preparing a Puri and then insert a tablespoon of the prepared mixture into the Puri and close the Puri nicely and roll slightly. 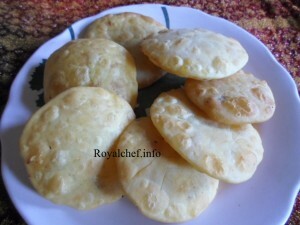 Heat the Ghee and deep-fry the Puri until color changes into light brown. कृती : मैदा, मीठ, गरम तूप घालून मिक्स करा. मन त्यामध्ये दुध घालून घट्ट पीठ मळून घ्या. आंब्याचा रस घट्टसर आटवून घ्या मग त्यामध्ये खोवलेला नारळ, पिठीसाखर, वेलचीपूड घालून मिश्रण तयार करून घ्या. मळलेल्या पीठाचे लिंबा एव्ह्डे गोळे करून पुरी लाटून घ्या. त्यामध्ये एक टे स्पून मिश्रण भरून पुरी बंद करा. व जाडसर लाटून घ्या. कढई मध्ये तूप गरम करून घ्या. 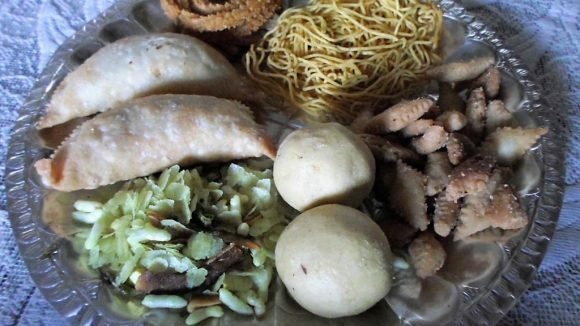 त्यामध्ये पुऱ्या गुलाबी रंगावर तळून घ्या.